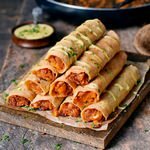 These Buffalo Chickpea Taquitos are crispy, spicy, and satisfying! No chicken needed for this protein-rich and delicious recipe. The taquitos are gluten-free, vegan, and easy to make. Using a fork, roughly mash the chickpeas in a bowl. Heat oil in a pan/skillet over medium heat and add the chopped onion and bell pepper. Cook for 3 minutes, then add garlic and spice mix and sauté for a further minute. Add all other sauce ingredients + chickpeas to the pan and bring the mixture to a boil. Let simmer on low heat for about 2-4 minutes, stirring occasionally, then turn off the heat. Taste the mixture, if you want it spicier, add more chili powder to taste. Preheat oven to 410 degrees F (210 degrees C) and line a baking sheet with parchment paper. Place about 2 tbsp of the filling onto each tortilla and roll them up tightly. Place every tortilla seam-side down on the baking sheet, next to each other. Brush them with a little bit of vegetable oil (to make them even more crispy). Bake in the oven for about 15-20 minutes or until they are golden brown and crispy. Drizzle with vegan cheese sauce (optional). Enjoy with your favorite dip!